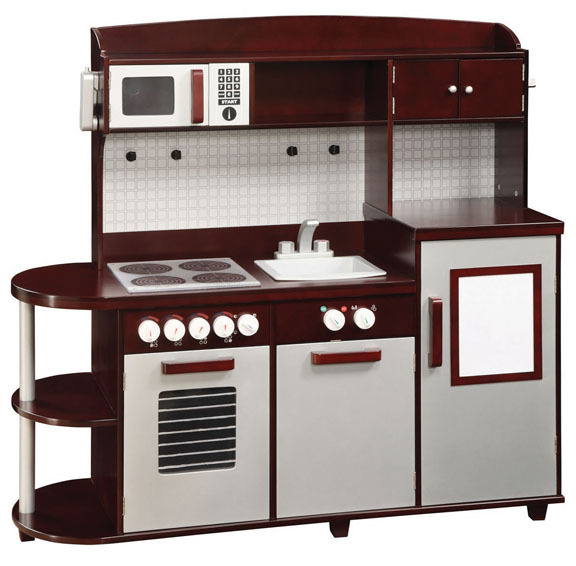 The Guidecraft All in One Modern Kitchen is a sleek, new addition to the Guidecraft play kitchen line, featuring a rich espresso finish with silver accents. This fabulous kitchen will provide children with hours and hours of imaginative, creative play and the colors are gender-neutral so it's perfect for both boys and girls! Great for the classroom, daycare centers and children's rooms or playrooms at home. 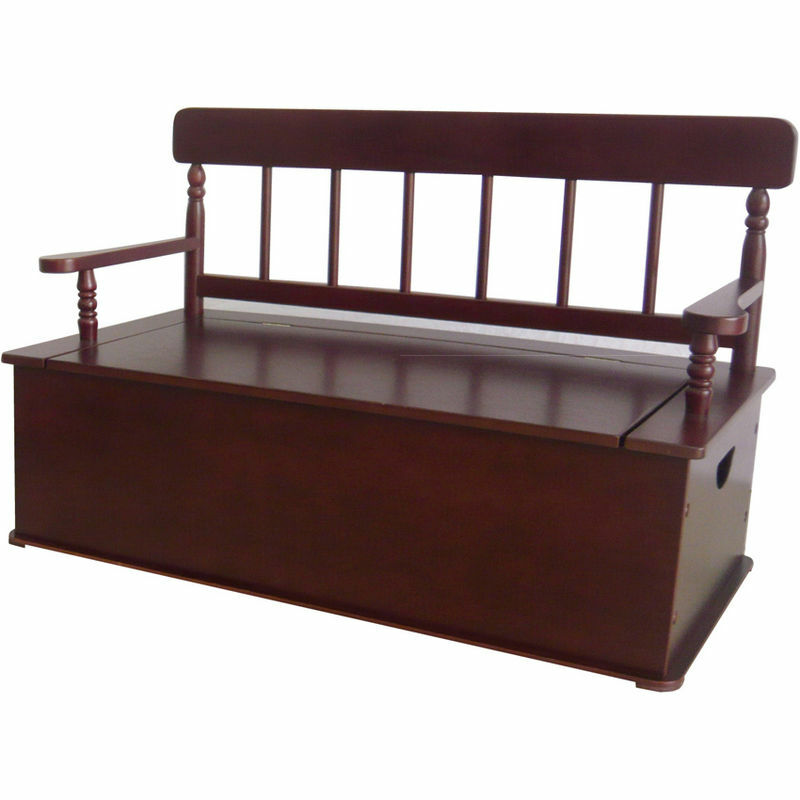 New for 2011 by Levels of Discovery is the Simply Classic Bench Seat with Storage. Using storage bench seats as toy boxes in children's bedrooms or playrooms goes a long way in getting the clutter off the floor as well as provide extra seating for kids. Or placed in your home's entryway, they make a great place for children to sit comfortably while they put their shoes on and take them off. They can then put their shoes inside the storage bin instead of leaving them on the floor. Levels of Discovery's Simply Classic Bench Seats with Storage are durably constructed of wood and have a special understamp beneath the seat that can be personalized. As with all their products, a photo greeting card is included so your child can say "THANK YOU" in a memorable way. Available in Pink, White, Cherry and Espresso, the Levels of Discovery Simply Classic Bench Seat with Storage will blend beautifully with your home décor. Levels of Discovery Simply Classic Furniture…Classic colors...timeless finishes...always in style! When my daughter was three, she "inherited" a fleecy, hooded dragon costume from a cousin. For weeks, she was obsessed with it - she insisted on wearing it wherever she went and even slept in the thing (I gave up trying to get her out of it except at bath time, when I put my foot down). While the costume was on, she was not only dressed as a dragon - she was the dragon; she would stomp around the house, claws bared and growling, until the cat would run away at the sound of her footsteps. Fortunately, the obsession faded, but was quickly replaced with an equally fierce devotion to a princess costume. As adults, a child's need to play dress-up can be as puzzling as it is amusing - what is your little one really thinking about when he or she spends days at a time dressed in a ballerina costume or police uniform? In fact, this type of dramatic play helps young children to learn some important life skills. When kids engage in imaginative play, they aren't just having fun - they are developing some vital social, intellectual, and manipulative skills. Dressing up in costumes, or in their parents' clothing, teaches them not only to zip, button, snap and tie, but to empathize with others; dressing up as a fireman, for example, helps a child to put himself in the fireman's shoes - so to speak. Research has shown that kids who engage in dress-up games tend to have a better understanding of other people's feelings and points of view later on. Role play helps kids to create imaginary scenarios that put their problem-solving skills to the test (how does the fireman rescue the kitten? ); kids who play dress-up together also learn to cooperate as they work out their imaginary scenario. Another important aspect of dramatic play is learning to think symbolically; a child who pretends that her chair is a throne is actually developing the intellectual areas of the brain that will allow her to comprehend writing, reading, and mathematics. If your child loves dressing up and pretending, you can encourage him by providing old clothes, costumes, plastic "jewelry," hats, last year's Halloween costumes, and anything else you can think of. 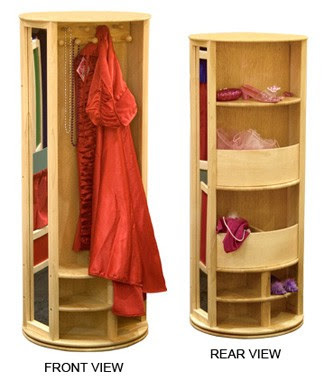 Create a dress-up space in your child's bedroom or playroom; the Guidecraft Dress-Up Carousel - available at A Kid Place - is the perfect way to store all of your child's dress-up items for easy access and quick clean-up when it is time to move on to a new activity. The Guidecraft Dress-Up Carousel comes in Natural and Pastel. Research has shown that imaginative play and drama are great ways for kids to develop important problem-solving, social and language skills; as they plan and put on a stage production or puppet show, they learn to work with others, make friends, express themselves, and best of all, have fun! The Lisa LeLeu Super Star Theater is the perfect backdrop for hours of acting and role play. With all of the Lisa LeLeu pretend theater's adorable features, you can raise the curtain on adventure whenever the acting bug strikes. The Lisa LeLeu play theater has everything you need to put your little ones in the spotlight. The "main stage" comes equipped with backdrop scenery and stage curtains, as well as a puppet theater panel. The wipe-off marquee announces coming attractions, while the ticket booth and snack counter add yet another dimension for role play and interaction. 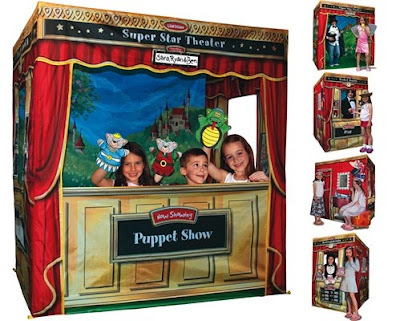 A play theater is perfect for a day care setting, party activity, or any time your little one feels the creative urge. You can find the Lisa LeLeu Super Star Theater at A Kid Place, where we have everything you need to encourage your child's imaginative play ideas. Visit us at www.akidplace.com for hundreds of high-quality, affordably priced children's items, from educational toys to art supplies, from musical instruments to hand-crafted kids' furniture for the nursery and playroom. The latest dollhouse that we are offering at A Kid Place is the Kidkraft So Chic Dollhouse. As with all Kidkraft dollhouses, the So Chic dollhouse is made of wood, handcrafted and hand assembled and accommodates Barbie and Bratz dolls as well as all other fashion dolls that are up to 12 inches tall. What’s unique about this dollhouse is that all 4 sides are open, making it accessible from all sides, so multiple children can happily play all at once. It is even set on casters, so, kids can easily turn the dollhouse rather than having to move around it. 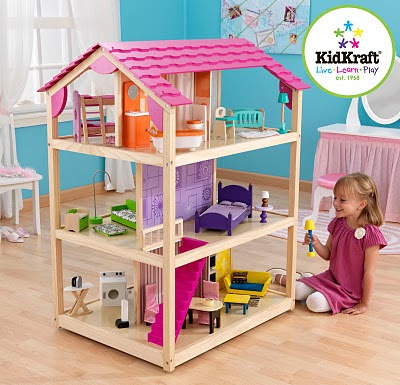 The Kidkraft So Chic Dollhouse has 3 floors, 2 staircases, 10 rooms that will provide plenty of space for Barbie and all her friends, and comes with 45 beautifully crafted pieces of wooden furniture. Do keep in mind that this is a heavy-duty dollhouse, weighing 83 lbs and it will take some time to put together. Also, 2 people are required to assemble this. Reviews on putting it together vary from being easy to taking hours. On average, it seems to take most people 1.5 – 2 hours to put together. Those that have grumbled about it taking too long to put together, however, said in the end, it was well worth it. Which is true if you think about it – spend a few hours on a real heirloom-quality wooden dollhouse, or spend way more time and money buying and replacing cheaply-made toys that don’t hold up and quickly fall apart. Not to mention that kids tend to throw the junky toys aside and forget about them. Also, be sure to take note of the measurements, as the Kidkraft So Chic Dollhouse is larger than it appears (34.25" x 27.25" x 46.25"), so you will want to be sure you have a good-sized open space for when your children are playing with it, so all sides can be utilized. The casters will be a tremendous help for when it’s time to put away; you can simply roll it. Though, you will most likely find that this dollhouse stays out all the time, as it’s sure to be a favorite. Should this dollhouse just be too big for your home, there are plenty of other really nice Kidkraft dollhouses that accommodate Barbie and Bratz dolls. No matter which one you choose, the memories will last you and your children a lifetime. Does Playing Video Games Cause Aggression in Kids? Parents are understandably worried when their kids play video games that have violent themes for fear these games could make their kids more aggressive. In one study, researchers scanned the brains of children after they played a violent video game and found decreased activity in areas of the brain associated with self-control - as well as increased emotional arousal. Do Video Games Cause Aggression in Children? New research published in the Journal of Youth and Adolescence may ease some of these concerns. When researchers looked at 302 Hispanic boys and girls, they found that neither playing video games nor watching violent television were predictors of future violence or aggression. But kids who were antisocial, especially those with depressive symptoms, were more likely to be violent or aggressive after playing these games. Overall, for the average child, playing these games had little effect. What does this mean for parents? At least in this study, kids who play video games or watch violent television are not more likely to be violent or aggressive with the exception of kids who have antisocial personalities or who are depressed. Video Games Don’t Cause Aggression: Should You Believe It? Of course, this is only one study, and it was limited since only Hispanic youth were studied. Other research has reached differing conclusions about whether video games cause violence in kids. A meta-analysis looking at twenty years of studies on violence and video games found kids who played violent video games were more aggressive immediately after playing them, although it was short-lived. One problem in exploring whether video games cause aggression in children is there are so many types of video games available. It’s possible that some of the more graphic video games with aggressive and violent themes make kids more aggressive while others may not. It could also depend on the age of the child playing it. Younger kids may be more likely to act out violent themes, because they lack the socialization and ability to distinguish between right and wrong that an older child does. Younger kids are also more impressionable. Most disturbingly, these games may actually de-sensitize kids to violence and make it appear acceptable to shoot at people or kick someone in the face using a karate move they learned on a video. When 80% of video games have a violent or aggressive theme in one form or other, kids may see violence as being okay and may have a hard time differentiating the fantasy of television and video from reality. Do Video Games Cause Aggression: The Bottom Line? Although this study was meant to reassure parents, the issue of whether video games cause violence is still on the table. At the very least, there are more constructive ways for kids to spend their time than staring at a computer screen and shooting at imaginary characters with their mouse. J. Youth Adolesc. 2010, December 14. Would you like to curb your kids’ junk food habit and help them make healthier food choices? According to a new study, healthy eating habits begin at home – with mom and dad. Kids eat healthy when parents show them how to choose the right foods – and when they keep junk food out of the cabinets and refrigerators. According to results of the 2010 American Kids Survey, which looked at the lifestyle, eating and purchasing habits of 5,000 children between the ages of 6 and 11, mom and dad have a major influence on whether kids eat healthy or whether they become junk food junkies. Kids are more likely to make the right food choices when they don’t have easy access to junk food and when parents emphasize good nutrition at home. Some of the insights from this survey were that parents who don’t keep junk food at home or eat it themselves are more likely to have kids who eat healthy. Keeping junk food out of easy reach of young hands not only restricts a child’s access to it, but lets a child know that nutrition is important. Another insight from the study was that kids whose parents show them how to read nutrition labels are more likely to read them themselves and are less likely to eat foods that have little nutritional value. According to this survey, kids who have parents who read nutrition labels are also more likely to participate in sports. When it comes to healthy eating habits for kids, the opposite is also true. Kids who have parents who don’t read labels, buy junk food and de-emphasize nutrition have children who make the wrong food choices and load up on more junk food. Set a good example for your kids. Talk to them about nutrition and encourage them to make the right food choices. Getting them involved in the decision-making process and rewarding them for choosing healthy foods is a good way to alter their eating habits for the better. Other ideas? Take them to the grocery store and challenge them to pick out healthier foods. Turn it into an educational game. Teach them the upsides of nutrition in a way they can relate to. Emphasize that good nutrition means more energy so they can run faster and play harder. Most kids like that idea. Let them help out in the kitchen by peeling vegetables and doing other simple tasks. Use that time to talk about the benefits of the food you’re making and how it relates to their health. The bottom line? Keep the cabinets and refrigerator free of junk food if you want healthy eating kids and teach them the importance of eating right. And don’t forget to lead by example.